Finally! I’ve fini­shed the tutorial for this purse~! As I warned earlier, it’s rather a tutorial showing how to make your own pattern than a pattern itself. I’m not sure if this tutorial makes sense to other people. I have some experience making knitting patterns, but never made a crochet pattern before. STEP1. Measure the frame you have. Draw the outline on a piece of paper and measure the width. Then crochet the bottom part to make the circumference of the bottom to be same as twice of the width from STEP2. ROUND 1: ch2, hdc all around. ch3, 6 dc only through the front loop of the first hdc of previous row, *7dc only through the front loop of the next hdc of previous row* rep from *to* all around the row. Then, ch2, hdc only through the back loop of the hdc of row 1. Rep the ROUND 2 until it reaches the height you want. STEP 5. Crochet to make the top shape decided at STEP 2. If you chose option1, you can simply add couple more rows of SC. If you chose option2, crochet front and back side separately, decreasing both edges to make the shape you want. If you chase option3, crochet front and back side separately, while keeping the edge straight up. STEP 6. 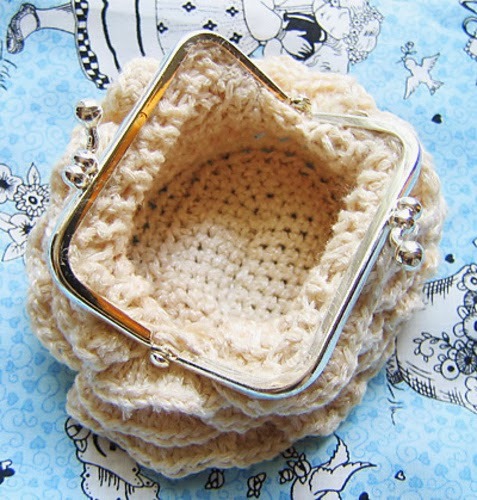 Sew the crocheted purse on the frame if your frame has holes. Otherwise, glue the purse in the ridge of the frame. Tada~You have a small wriggly purse! hi ! cool stuff !! that is SO adorable! thank you so much for posting this!! Hi, this is a great coin purse! It's very super-cute! Can you give any tips on choosing a yarn size? Thanks! Wow, that is really cute! Now I know what to do with the old purse frame I have laying around. Just curious--where did you get the little metal frame for the top of your purse? This looks beautiful!!! I love it. I've always wanted to make this, and I finally started... sadly I ran out of yarn very early (I only had a bit, but desperately wanted to start), hopefully I'll get more yarn soon. Where did you find the small metal clasp part of the coin purse? I've looked at places like hobby lobby but couldnt find it. I'm dying to make this but have no idea where to get the metal part. beautiful purse! I tried making one as a gift for my sister but mine didnt come out looking as yours does:( Perhaps with more detailed instructions or more practice on my part:) it will come out looking better! I just found out that I need to moderated the comments to see them on my blog, after all this time! Silly me! I see many people asking me where I got the purse frame. I bought my coin purse frame when I was visiting Korea. However, (don't despair! :D)I saw many American craft stores carries them too. I actually some Hobby Lobby and Michael's carrying them, but not all the stores.. If you want to order them online, google "metal purse frames" then you will see many options. One of the online store I know is "www.umei.com". They carry tons of different kinds. I haven't ordered from them yet,so I have no idea how their customer service is like. I've already done one, it's in my blog. "ch3, 6 dc only through the front loop of the first hdc of previous row, *7dc only through the front loop of the next hdc of previous row*"
I guess you are not familiar with the term "crocheting through front or back loop only". You can refer to below page. 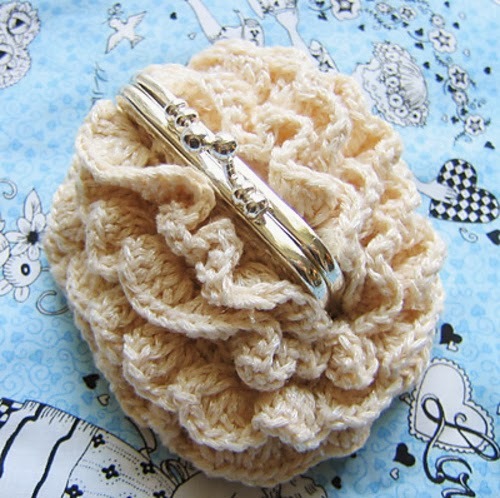 It shows how to crochet only through front or back loop in detailed pictures. Very cute and flirty. I undertand perfectly about hte tutorial. The general idea is enough for anyone that's creative. Thanks for sharing. this is so cute..and retro...thanks for sharing the pattern. I am having a little trouble though in Step 4 ROUND 2. I keep having this feeling that I should be working the dc's in the back loops of the previous rows, not the front! My wriggly things keep turning inside rater then out. What do you think I'm doing wrong or should I just keep going and see if it turns out right? If you are working the side of the purse flat and sew the seam later, you need to work on the ruffles through the back loops and background though the front loops of the previous row. However, this instruction was given to crochet the bag in round. In that case, it is correct to makeruffles through the front loops of previous row. Great tutorial! I'm definitely going to try it..
thank you so much for sharing this beautiful pattern. I make two coin purses with your tutorial. They were a little different but I like it! I put a link to your tutorial in my post. Great tutorial! i love it, thanks for sharing. I used Japanese 3mm hooks, which is between US size C & D.
Since I crochet relatively loosely, you might want to try using hook size D.
Wow! This is too cute! Im thinking Christmas presents=) Did you use a 4-ply yarn? Thanks,I used Bernat Cool Crochet. It says it's 5-ply on Ralvery. This is a gorgeous little purse! I would LOVE if you link this up to my new link party just for the fiber arts!